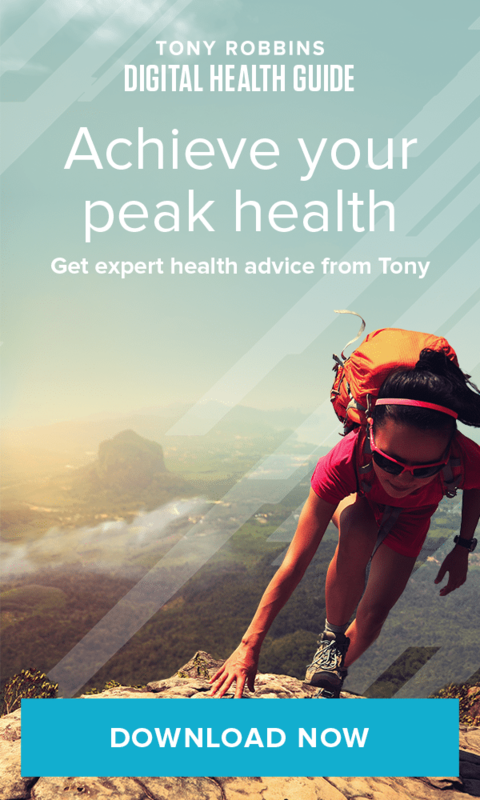 Home » The Tony Robbins Blog » Health & Vitality » Diabetes: Are you at risk? Diabetes is plaguing the country. According to a recent study published in JAMA, half of adults across the U.S. have diabetes or blood sugar so high they’re almost diabetic. People with diabetes either have an inability to produce insulin to lower blood sugar (type 1 diabetes) or they have too little insulin or cannot use insulin effectively (type 2 diabetes). The results, which were based off an evaluation of 5,000 patients of varied ages, sexes and races, showed that the majority of the diabetics are type 2 — which is most often the result of obesity, poor diet or lack of exercise. This isn’t a diagnosis to be taken lightly. Diabetes has been linked to an increased risk of Alzheimer’s and can cause serious damage to the heart and blood vessels, the eyes, kidneys, nerves and even the gums and teeth. And the American Diabetes Association estimates that 71,000 individuals die annually from complications associated with the metabolic disorder. Obesity is a known risk factor for metabolic disorders. And there have been a number of scientific studies that have linked obesity to a raised risk of type 2 diabetes. But exactly what qualifies as obese? The CDC defines obese as a BMI, or body mass index, of 30.0 or higher. BMI is a measure of body fat based on your weight in relation to your height. And, generally speaking, the higher the number, the more body fat the individual has. To calculate your BMI, try using the CDC’s body mass calculator. With more than one-third of U.S. adults estimated to be obese, it’s more important than ever to be aware of how your BMI measures up. This will help you determine how much fat you have, how much you have to lose and where your goals should be. Increasing physical activity is one of the best ways to keep a healthy weight and help vital organs functioning correctly. But did you know that by breaking a sweat you can also help prevent the onset of diabetes or pre-diabetes? It comes down to visceral fat, or, more specifically, the fat that accumulates around your mid-section. This type of fat works to block the action of insulin, which is vital for the body to lower blood sugar. Insulin normally tells the liver to transport extra blood glucose and store energy for future use, but when the liver is embedded in fatty tissue, insulin cannot communicate with the liver as clearly. And as a result, blood sugar starts to build up in the bloodstream, and can seriously damage your organs. In fact, the presence of excess belly fat is so risky that one study found that overweight individuals who have a large waist, which is defined as 35 inches or more in a woman or 40 inches or more in a man, have an almost equal risk of developing diabetes as an obese person does. Fortunately, visceral fat is particularly responsive to exercise and diet. So get moving and help your body become more receptive to insulin. We all know the benefits dietary fiber has for your digestive system, but did you know that fiber is also a healthy way to help control high blood sugar? In a study published in Diabetologia (the journal of the European Association for the Study of Diabetes), researchers found that consuming greater quantities of dietary fiber reduced the risk of developing type 2 diabetes. The authors of the study found that participants with the highest total fiber intake (more than 26 grams per day) had an 18% lower risk of developing diabetes compared to those with the lowest total fiber intake (less than 19 grams per day). When fiber is digested, your body responds differently than it does when you consume refined carbohydrates, such as pasta and white bread. Unlike the refined carbohydrates, which are broken down into sugar molecules, fiber cannot be digested. Instead, it passes through the body, which means it does not require insulin to process and no dreaded sugar spike. By making simple switches, such as swapping fresh whole fruits for fruit juices, replacing white bread, rice and pasta for whole grain products, and incorporating more raw veggies, beans and legumes into your diet, you can help increase your fiber intake and take a healthy step in the right direction. People tend to associate high-fat and high-carbohydrate diets with diabetes risk, but recent studies have shown that your source of protein is a critical factor to consider as well. And what researchers discovered is that individuals who ate the most animal-based proteins (meats, dairy, eggs) were more likely to be diagnosed with diabetes. Plant-based proteins, on the other hand, are not linked to diabetes. Vitamin D, also called the “sunshine vitamin,” is known to help the body absorb calcium and maintain bone and muscle health. But did you also know that vitamin D deficiency have been linked to an increased risk of developing diabetes? A number of epidemiological studies have found that those with low vitamin D levels were more likely to have type 2 diabetes or pre-diabetes, regardless of how much they weigh. It is believed that the cause stems from the fact that people with vitamin D deficiency have both diminished beta-cell function and increased insulin resistance. And, unfortunately, the vast majority of people are estimated to be vitamin-D deficient. Yet by maintaining a healthy diet and getting enough outdoor activity, you may be able to reverse the association. Exposure to sunlight triggers the body to produce vitamin D. Vitamin D can also be found in such foods as salmon, certain mushrooms, fortified cereals, or it can be taken as a supplement.